365 Days of Kale: Garlic and Kale - together at last! Garlic and Kale - together at last! 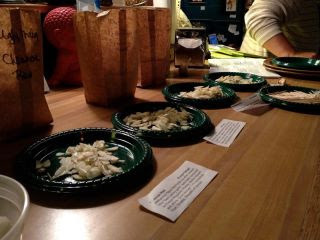 My husband and I were invited to do a 'garlic tasting' and food pairing at a local coffee shop that enjoys educating its customers about coffee and other foods. We chose 4 very different tasting garlic varieties for tasting raw plus a wide selection of simple foods to taste between each variety, both as palate cleansers but also as a flavor-pairing. There were two surprise 'hits' for the flavor pairings, the first being toasted unsalted almonds paired with a type of garlic that has a 'sweet finish' (Romanian Red) and the second being kale (we used the lacinato kale from Seeley Farm in Ann Arbor). Lo and behold, today I found two scientific articles showing increased cancer-fighting activity when molecules found in garlic and kale were paired together. They are cell studies, not even animal studies, but they point to the facts that (1) our foods are filled with molecules that have 'bio-activity' and (2) this wide array of molecules consumed together, even at very low dietary intake levels, is likely to enhance (i.e., increase) the effectiveness of each individual molecule, which is called synergistic action. Is kale on that pumpkin? Two haikus - Just for fun! Food, not pills - again! What to do with turnips!